Our continuing education courses are approved by the Texas Department of Licensing Regulation to meet your CE requirements for your HVAC license renewal (TDLR Approved Provider #1883). Take the continuing education to renew your TX HVAC license today. All of our courses can be completed At Your Pace Online to help you meet the state's requirements to maintain your license. Once you finish your class you will have an official certificate of completion to save for your records, and we will report your course completion to the state for you. This 8 hour continuing education course primarily covers HVAC systems and the 2015 International Mechanical Code. This course will examine relevant laws and regulations of the State of Texas, the 2015 revision of the International Mechanical Code, and professionalism as it applies to tradesmen. 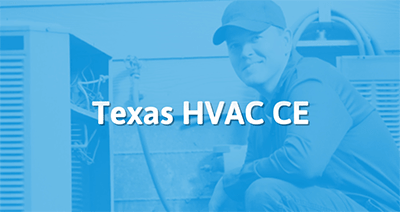 This course is intended for tradesmen in Texas who need to renew their HVAC license.